December | 2014 | Extollagy! ‘You have an extraordinary talent for rendering your erudition accessible’; ‘This has been the trip of a lifetime for me’; ‘Jon Cannon is as good as it gets as a scholarly authoritative lecturer’; ‘In a word, extraordinary’; ‘ a sensitive, funny man who brought to life … the medieval world.’… just some of the comments received from my 8-day Cathedrals of England extravaganza. If you’d like to share in this experience (I couldn’t possibly comment!) here are the dates for 2015. Also be aware of events upcoming in 2016: A two-day residential ‘dayschool’ on Canterbury cathedral; the four Martin Randall Travel Cathedrals of England tour, and a newbie from MRT, Sacred China. 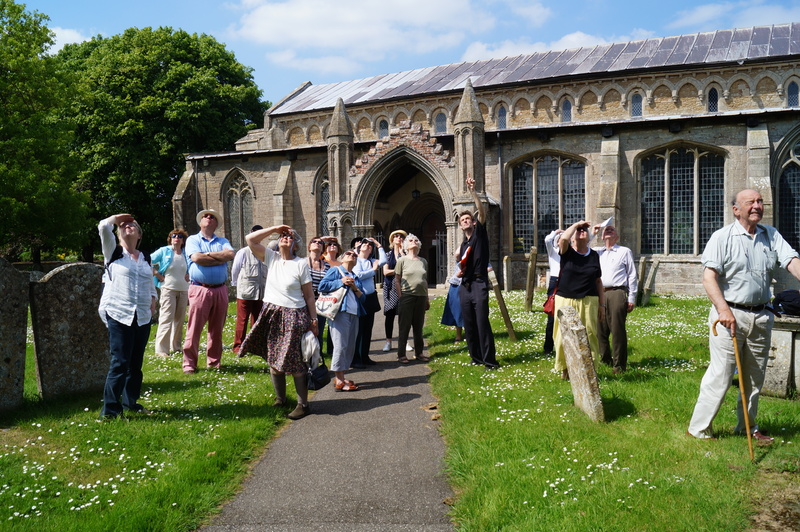 A group play ‘where’s the church?’ at West Walton. We never did work out where it was. Luxury hotels, epicurean meals, exclusive musical recitals — and an expert 8-day show-round of ten of the greatest buildings on Earth. A journey into the roots of English architecture, visiting a selection of the country’s finest surviving Anglo-Saxon churches, plus such Romanesque gems (with ancient roots) as St Albans, Waltham abbey and more. Excellent food and accommodation. From mighty Norwich to exquisite Lavenham, discover a lost world of medieval life and architecture. Excellent food and accommodation. Some of the most famous churches in the country. Excellent food and accommodation. I am also lecturing, mostly to NADFAS groups, in New Zealand (a three-week tour! ), Malmesbury, Monmouth, Wey Valley, Newick, Welwyn, Liverpool, Cockermouth, Hexham and Stratford-upon-Avon. Contact me (jon_cannonAThotmail.com) if you would like to attend one of these talks, which are open to the public for a small fee. Also regarding private tours, if you would like to arrange something. People rave about these tours: I hope you’ll come along.